bangalore drinks: beer, rum, + food at toit brewpub. on priyanka and deboo’s last night in town, prakash and i met them and their friends at toit brewpub in indiranagar. even though i am not a big beer drinker, i have become a pretty big fan of toit in the last few months. for one, toit was a lifesaver back in february when i was in need of wifi and all the coffee shops in indiranagar were failing me. and for another, it’s a seriously cool space, with three levels of seating to accommodate more people than you would think possible. 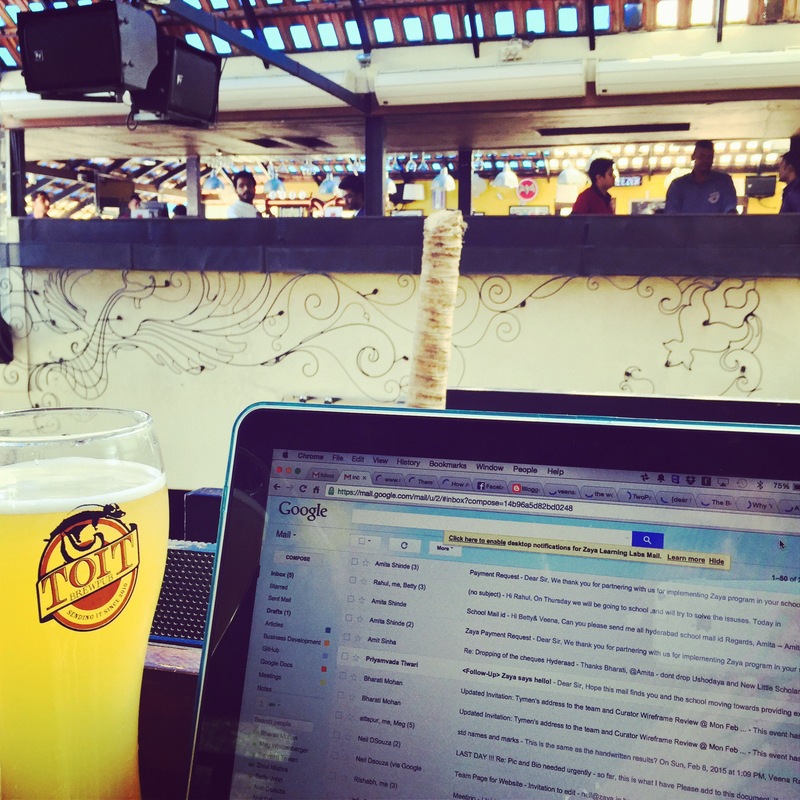 just your average tuesday afternoon workspace in a brewpub. bangalore, india. february 2015.
on this night, we managed to snag a table downstairs for our group of 15, and we set up camp for the night. there was plenty of beer to go ’round, and we gorged on food as well. not being in the mood for beer, i opted for old monk and was pleasantly surprised to find out that toit does not charge for mixers. in my 10 years of drinking in bangalore, i’m pretty sure that’s the first time that has happened. an extra 10 points to you, toit. the drinks were good and the company was fantastic, but i think the highlight of my evening was the goan sausage pizza. 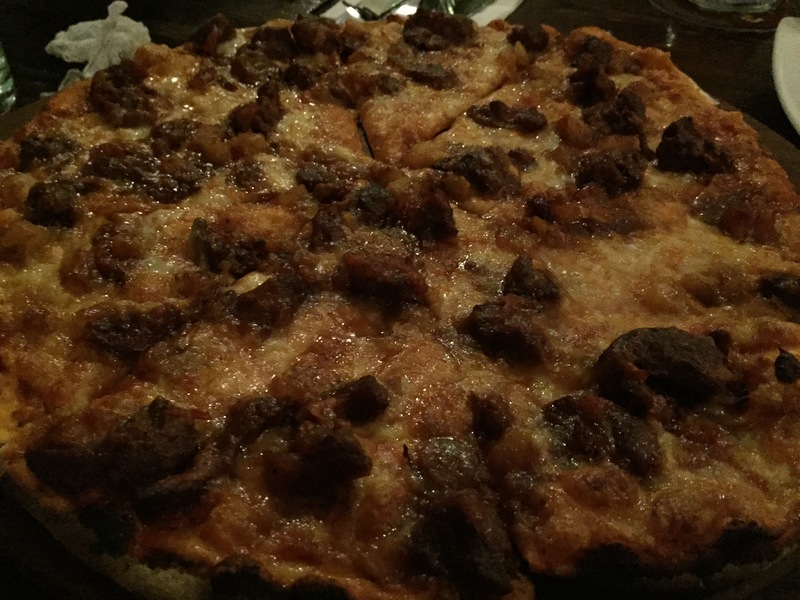 goan sausages are a huge favourite of mine, and toit’s pizza was pretty close to perfection. it comes highly recommended by both me and harish, which is pretty high praise for food. we had a few other starters that were pretty good – especially the nachos – but that pizza took the cake. goan sausage pizza at toit. bangalore, india. march 2015.
location: 298, 100 feet road. indiranagar 2nd stage. bangalore. landmark: near kfc and the cmh road signal. serves drinks: yes. famous for their home brews + full bar available. wifi available? yes. and it tends to be much more reliable than most of the coffee shops in the vicinity. what we ordered: lots of beer; 30ml of old monk x 2; coke [drinks]. nachos; potato skins; and various others [starters]. goan sausage pizza [main course]. our bill: i don’t remember the exact number, but it was roughly rs 7,600 split between 13 people. we each paid rs 600, which was pretty reasonable. my zomato rating: 4.5 / 5. average rating is 4.7.
fun facts: it’s a pretty good place for a lunch meeting or as an afternoon workspace, if you just need a change of scenery. to keep in mind: it can get super crowded post 8.30pm during the week and stays pretty packed over the weekend. get there early to grab a table and enjoy your evening. will i go back? for sure. who else out there loves toit? even as a non-beer drinker, i’m a pretty big fan of the place. weekly roundup 07 // 2015.
adventures in house hunting, bangalore edition.